By 1939, Anglo-American journalist John Russell has spent fifteen years in Berlin, where his German-born son lives. He writes human-interest pieces for British and American papers, avoiding the investigative journalism that could get him deported. But as war approaches, he faces the prospect of having to leave his son and his longtime girlfriend. Then, an acquaintance from his communist days approaches him to do some work for the Soviets. Russell is reluctant but ultimately unable to resist. He becomes involved in other dangerous activities, helping a Jewish family and an idealistic American reporter. When the British and the Nazis notice his involvement with the Soviets, Russell is dragged into the world of warring intelligence services. David Downing grew up in suburban London. He is the author of numerous works of fiction and nonfiction for both adults and children, including four novels featuring Anglo-American journalist John Russell and the nonfiction work "Sealing Their Fate: The Twenty-Two Days That Decided World War II." He lives with his wife in Guildford, England. 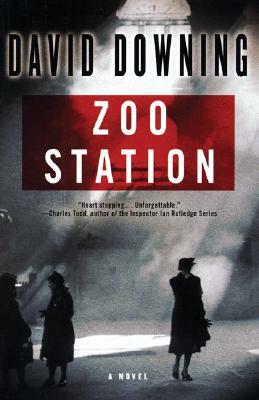 "Zoo Station (book one) hooked me on the first page." "Epic in scope, Mr. Downing's "Station" cycle creates a fictional universe rich with a historian's expertise but rendered with literary style and heart."